Colombia, home to over 185,000 Latter-day Saints, will soon be the home to a second Mormon temple. The Barranquilla Colombia Temple will be the second temple built in Colombia, following the Bogotá Colombia Temple which was built in 1999. 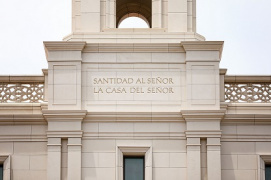 Thomas S. Monson, President of The Church of Jesus Christ of Latter-day Saints, announced the Barranquilla Colombia Temple on 1 October 2011, during the Saturday morning session of the 181st Semiannual General Conference of the Church. 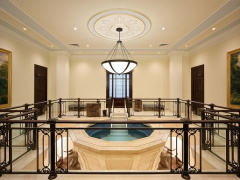 When the temple is finished it will include a baptistery; instruction rooms; a celestial room, which represents eternal life with God; and sealing rooms, where eternal marriages are performed. People from North America living in Cali and Bogotá made up most of the first 45 members of the Church in Colombia. Then, in May 1966, the first LDS missionaries arrived in the country. Five years later, there were 27 congregations meeting in 10 different cities. In 1975, a chapel was built. Today, Colombia’s 263 congregations contain a membership almost 19 times what it was 20 years ago. There are now five separate missions dividing the country regionally. The congregations are divided into 29 stakes and 12 districts. 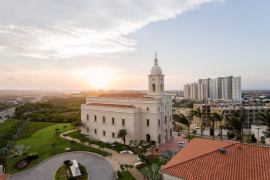 The Barranquilla Colombia Temple will be built just outside of Barranquilla, Colombia, in Puerto, Colombia, across from Colegio Alemán, approximately two kilometers west of Barranquilla proper, on the highway to Cartagena. The temple will rise from a hill overlooking the biggest river in Colombia - the Magdalena River - and the ocean. Latter-day Saints from Colombia and Venezuela will worship in the Barranquilla Colombia Temple to find peace and draw closer to God. The Barranquilla Colombia Temple will serve members from the following seven stakes and two districts in Colombia: Barranquilla Colombia El Carmen Stake, Barranquilla Colombia Hipodromo Stake, Barranquilla Colombia Paraiso Stake, Cartagena Colombia Los Alpes Stake, Cartagena Colombia Stake, Montería Colombia Stake, Santa Marta Colombia District, Sincelejo Colombia District, and Valledupar Colombia Stake. Five decades ago, the South American land of Colombia - a land renowned for its rich culture, natural beauty, and welcoming people - was dedicated for the preaching and establishment of the restored gospel of Jesus Christ. Now, a half-century later, work has begun on the second temple to be built in the country. On Saturday, 20 February 2016, members across Colombia participated in the ceremonial groundbreaking of the Barranquilla Colombia Temple. Elder Juan A. Uceda, a General Authority Seventy and President of the South America Northwest Area, presided over the outdoor ceremony at the site of the future temple. Thousands of others viewed the event, via satellite, in meetinghouses across the country. Also in attendance were local government, police and business leaders. In the course of his remarks, Elder Uceda said that it is no coincidence that a temple is being built in Barranquilla on the 50th anniversary of the Church in Colombia as the hand of the Lord is at work. He challenged members across Colombia to make temple attendance a sacred, well-established family tradition. He told the members to attend the temple frequently, and "then return and share your experiences with your children and grandchildren so they know that the temple is an integral part of your life.” He added that attending the temple is a beloved tradition in the Uceda family. [Elder Uceda] encouraged the members to make their own family temple traditions even as they prepare for the future Barranquilla Temple. 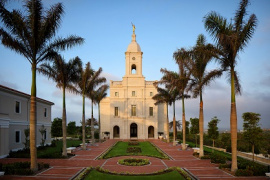 Attend the Bogota Temple (which was dedicated 24 April 1999) as often as possible, he encouraged them, and he counseled them to hang pictures of the temple throughout their homes and engage in family history research and begin preparing names for work in the Barranquilla Temple. Latter-day Saints in the future temple district can also acquire and maintain a temple recommend. Then keep your temple recommend in your pocket every day of your life, even if you live far from the temple. In his prayer of dedication on the temple construction site, Elder Uceda evoked the Lord’s blessings for all who would help build the temple — and for the members and government leaders in Colombia. Following the dedicatory prayer, Elder and Sister Uceda joined the civic leaders and other special visitors for the ceremonial groundbreaking. 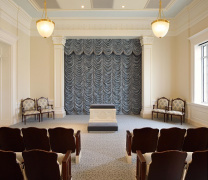 The pictures in this gallery were obtained from LDS Daily.com. 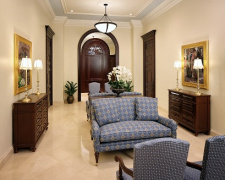 The First Presidency of The Church of Jesus Christ of Latter-day Saints has announced that a free open house will be held for public tours of the newly completed Barranquilla Colombia Temple of The Church of Jesus Christ of Latter-day Saints starting on Saturday, 3 November 2018, through Saturday, 24 November 2018. The open house will not be conducted on Sunday, 4, 11, and 18 November. To make a free reservation to attend the open house, visit Temple Open House. Tours will consist of a 10-minute video presentation followed by a 40-minute walking tour through the various rooms of the temple. The Barranquilla Colombia Temple is the Church's second temple in Colombia. The Bogota Colombia Temple was completed in 1999. It is located just off the Via al Mar, at Carrera 30 No. 1-1481, Puerto Colombia, near the Colegio Alemán and the Universidad Del Norte. It is the 161st temple of the Church in the world, and the 19th in South America. There are 10 additional temples announced or under construction in South America. The Barranquilla Colombia Temple will serve some 35,000 Latter-day Saints in Colombia’s northern regions. Youth are invited to attend a devotional especially for them on Saturday, 8 December 2018. On Saturday, 8 December 2018, prior to the dedication, President Oaks and Elder Ulisses Soares of the Quorum of the Twelve Apostles greeted and spoke to Latter-day Saint youth in a special devotional. During his remarks, Elder Soares told youth, "Whatever you do, keep your eyes on the temple. We invite you to go to the temple and do the vicarious work for your relatives and others. We are all transformed when we go to the temple." 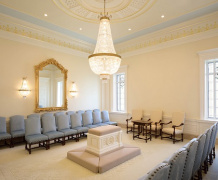 The Barranquilla Colombia Temple was formally dedicated Sunday, 9 December 2018, in three sessions at 9:00 a.m., 12:00 p.m., and 3:00 p.m., by President Dallin H. Oaks, First Counselor in the First Presidency of The Church of Jesus Christ of Latter-day Saints. The dedicatory sessions were broadcast to congregations of the Church in Colombia within the temple district. Before the first dedicatory session, President Oaks, Elder Soares, and members of the local Church leadership participated in the cornerstone ceremony. President Oaks explained that placing mortar around the cornerstone block is symbolic that the temple is complete. He invited Church leaders, as well as, a young boy and a young girl to fill the cornerstone with mortar. President Oaks said, "These children represent the rising generation, the future leaders of the Church in Colombia." The Barranquilla Temple is the Church's 161st temple worldwide and the second in Colombia, the first having been completed in Bogota in 1999; it is the 19th in South America. This temple will serve approximately 35,000 Latter-day Saints in Colombia’s northern regions.